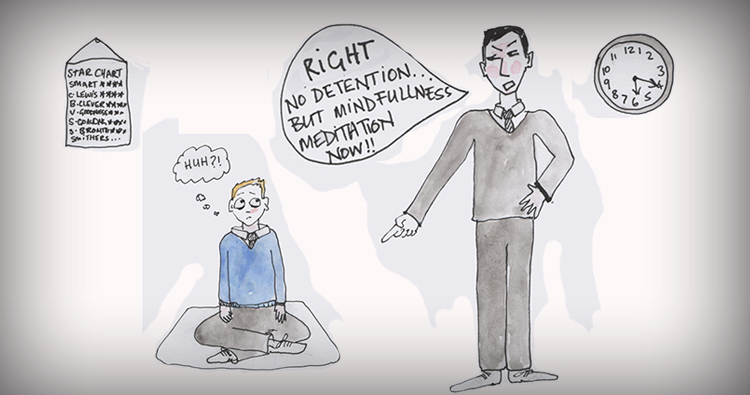 The manipulation of mindfulness into schools is cause for concern. It is tough for our schooling systems to reform themselves root and branch in the way we need. Mainstream schooling certainly has not and it is unlikely that it even can. In a way it is no surprise that a coercive, directive and conditioning educational system is resorting to hijacking and distorting enlightened spiritual principles to pacify, control and punish children. Some schools are mandating mindfulness instead of detention or are putting it into the curriculum. On first presentation this might be seen as a good thing. After all, meditation and mindfulness are pretty much accepted as a force for good now by the establishment. But context and agendas matter and in the context of the minds of our children in the schooling system and the agendas that the system is following, there is a sinister hijacking taking place and it is one we should all be concerned with. Detention is a punishment. The child has done something wrong according to the systems rules ( and the crime no doubt was in some way an expression of utter boredom or rebellion with the system itself ) and the school decides to meet out punishment. All this rebellion and misbehaving can’t possibly have something to do with the rotten system or the conditions children are having to endure can it? Of course not. The child must be at fault. In a punitive system the punishment needs to be something the child does not like right? Otherwise it is not a punishment. Otherwise we would be given kids ice creams and more Minecraft time when they did something wrong. No, they have to suffer, as a deterrent. So how does mandating mindfulness fit into all this? Either it is not a punishment in which case why include it? Or it is. And if we are seriously proposing the imposition of mindfulness as a punishment then the wheels are truly off. 1. The experience of mindfulness will be received and experienced as a punishment. The result? The child or teenager grows up to associate it with unhappiness, suffering and being wrong. Oh, and emotionally feeling ashamed, angry and guilty. Anyone think that those adults might grow up to find mindfulness something that they avoid or never go near again? Anyone here remember the utter nonsense of enforced religious practice? Once mindfulness is associated with a punitive system then it will get rejected by the enlightened young person who decides to free their mind. 2. Meditation and self awareness as sedative and compliance. The system might like this one as after all isn’t the idea to get little Johnny and Naughty Nicky to stop being themselves and conform to the idiotic boring system? Yup. So maybe the use of mindfulness will crush that rebellious free spirit. This allows the system to carry on as before and not have to question itself. 3. Incredible indifference from children. There is a protective cynicism that arises in and wraps around children when they find themselves unplugged from the joy and freedom of childhood. This cynicism means they end up discounting almost immediately whatever the system mandates for them. With some luck they will just see mindfulness as another word to reject. Later in life the road to self-hood will not be going via the ubiquitous mindfulness that will no doubt have rolled even further over a passive workforce. Hopefully meditation and other disciplines will still find their way into our children’s worlds and help them set their minds free. After all isn’t a free mind what we want for our children? So the schools are reporting amazing results. Yes, for the school. i.e job done. Child is now a ‘good’ conforming child and so can receive the schools blessing. Yet again we bump into the overwhelming agenda of education, conforming with the system. That the system itself is utterly out of date, not fit for future purpose is never presented as a possibility. But it is a reality. That children act out in school should be seen as much a problem with the school and the teachers and those who run it as well as the society in which those children live. Sending kids off to a mindfulness room is no more than the technique of good old social isolation (with solitary confinement as effective torture at the far end of that continuum) which, as is well known, is a good way to get a person’s attention especially when they are young. When you get the attention of another person through the tactic of fear and anxiety you had better know that that we will all pay a price for that. Aligning manipulation and coercion with mindfulness is sinister as it pollutes the word mindfulness and starts a process of priming it in a way that will not evoke joy and freedom and spiritual progress but rather align it with a group of feelings including shame and guilt. The world is changing rapidly, we are being called to change too and our children have to make sense of the future which we older generations might have made a major challenge to say the least. They need us to stop trying to push and control them into thinking they are going to be living in a future that is like the past. We are never going back to the past and try as it may the educational system needs to wake up to that fact. Perhaps the schooling system itself could benefit from some mindful meditation to up it’s self awareness. We adults rightly feel some panic about what will become of our children as we witness unprecedented change at a ferocious speed and watch as jobs disappear and wealth continues to pool into the accounts of the 1% (if things carry on like this it will be the 0.5%, then the 0.25% until there is nothing left). Our children need us to evoke a great feeling of freedom and possibility and some courage for who they can become, and need to become, to meet the future. They need love, collaboration and nurturing. They need childhood returned. The tragedy of all this is that true mindfulness (Buddhism without Buddha) is actually a treasure of human experience and a method for freedom. It is a guide for the emancipation of the conditioned mind to the wide open endless spaces of wonder at the miracle of human consciousness and transcendent connection with the true reality of existence. In other words enlightenment. Anyone looking around the world can see that we need all the enlightenment we can nurture and evoke if we are to safely take these next great steps into the future. We need an enlightened response to the evolution of our world not an attempted hijacking of the tools of enlightenment and freedom to keep us enslaved to fear and coercion.